Editors’ Note: The Points review of Prohibition continues with a consideration of Episode Two: “A Nation of Scofflaws,” which examines the rise of the illicit alcohol market and the state response. Thanks to Prof. Frankie Bailey for providing her assessment (readers can learn more about Prof. Bailey at our Guest Bloggers page). Readers interested in Episode One can read David Fahey’s take here. In Episode Two: “A Nation of Scofflaws,” legal scholar Noah Feldman observes: “To pass a law in the real world means nothing; to enforce the law means everything.” The inability to enforce the Volstead Act is the focus of the second episode of Prohibition. In 1924, the Boston Herald sponsored a contest to come up with a new word to describe someone who flaunted the law by drinking alcoholic beverages that had been illegally made and sold. The newspapers received 25,000 entries, and awarded the $200 prize to the two readers who independently coined the same word – “scofflaws.” As the episode tells us, by 1924, Americans across the country were flaunting the Volstead Act. but an experiment that had little chance of succeeding. These reasons are familiar to students of Prohibition: (1) the draconian language of the Volstead Act which banned not only hard liquor but beer and wine and created resistance and resentment; (2) the decision not to place the federal Prohibition agents under the Civil Service system which allowed politicians to hand out the positions without regard to the qualifications of the applicants and/or their commitment to enforcement of the liquor law; (3) the failure to hire a sufficient number of Prohibition agents or to pay them an adequate salary; (4) the lack of interest at the state level in committing manpower and other resources to enforcing an increasingly unpopular federal law; (5) the ability of organized crime to corrupt local, state, and federal politicians and law enforcement agents; and (6) the demands placed on the criminal justice system – particularly the courts – to process the cases brought under the Volstead Act. Episode Two focuses on the opportunities created by Prohibition for those who were willing and able to exploit the loopholes in the Volstead Act that allows alcohol to be manufactured and sold for certain purposes. Among them was Roy Olmstead, a Seattle police lieutenant who, after being fired from his job for violating the liquor law, became an entrepreneur by making use of his insider’s knowledge. The episode also features George Remus, the criminal defense lawyer, who moved to Cincinnati and became the “king of the bootleggers.” But as the episode points out Prohibition also provided opportunities for petty criminals who were now able to make a good living by providing services in this new black market. Even more important with regard to long-term social consequences was the opportunity Prohibition provided for the rise of organized crime. 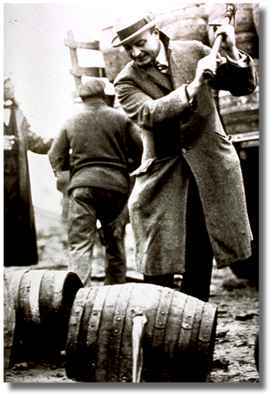 Old time gangsters were pushed out by up-and-comers who saw the possibilities offered by Prohibition and were willing to use the force required to dominate a lucrative market. In New York, the state that the Anti-Saloon League had considered crucial to the success of Prohibition, the Mullen-Gage Act which had mandated state enforcement of Prohibition was later repealed. Although the documentary does not delve into this, in New York and other states, local law enforcement did have some incentive to arrest public drunks for the fines that could be collected. But at the same time – an issue that was touched on – local governments was called upon to deal with the unintended public health issues related to adulterated alcohol. At the same time, in New York and elsewhere, the state police needed to respond to rumrunners. In New York, which shares a border with Canada, the state police found themselves pursuing rumrunners who used the network of back roads and bribed local farmers to use their barns as hideouts. Formerly law-abiding residents of border towns found they could make a good living by cooperating with criminals. In this respect, Episode 2 raises some intriguing questions about the consequences of an unenforceable law. What is the impact of civic life when citizens come to see a law as not only an infringement on their rights but as possible to defy without significant consequences. What is the impact when law enforcement officers are viewed by the public as corruptible and corrupted? In this environment, a violent gangster such as Al Capone could acquire the status of both a “public enemy” and a folk hero. The public would develop a fascination with gangsters and organized crime that continues to this day. Even though the Hollywood Production Code said that crime must not pay, in the movies to which audiences flocked, the gangster symbolized the rise of the working man, his climb up the “crooked ladder,” symbolized that moment when a tailor measured him for a suit and tuxedo. In fact, one use of this documentary would be to engage students in a discussion about the mythology of the gangster as violent hero that emerges during Prohibition. This mythology is particularly interesting when applied to the images of the “new jack” gangsters who appear in films during the urban “war on drugs.” At the same time, the emergence of federal law enforcement agencies in the 1920s and 30s, particularly the Bureau of Investigation (later the Federal Bureau of Investigation) should be examined as a by-product of the war on crime that begins during the Prohibition era. At a time when both organized crime and federal law enforcement was undergoing transformations, the modern discourse about the meaning of crime and justice in American society was also taking shape. This is illustrated in Episode 2 by the story of Roy Olmstead, the former police officer turned bootlegger. After being arrested and convicted based on evidence obtained by the wiretapping of his private telephone conversations, Olmstead challenged the use of this new technology. Olmstead asserted that the wiretapping had been an illegal search and seizure under the Fourth Amendment. Although the Supreme Court denied his appeal, in his dissenting opinion, Associate Justice Louis Brandeis offered what would become a classic statement about the citizen’s right to privacy and protection against unlawful intrusions by the state. In his opinion, Brandeis rejected the idea that ends justified means. This question of how far the state should go in its attempts to enforce the law remains one of the crucial issues in our society.